THE SOCIAL NETWORK. Directed by David Fincher. Starring Jesse Eisenberg, Rooney Mara, Bryan Barter. A story about the founders of the social-networking website, Facebook. REVIEW. I’d been wanting to watch The Social Network for a while, and finally got to watch it a few days back. I expected a certain amount of awesomeness, as the movie was being made by kickass people. I was also mildly interested to see what Justin Timberlake would bring to the film. I expected flashes of Harvard dorm life, a lot of “staring out of the window as an indie-pop song is played” (in a very biopic-y way) interspersed with boring court scenes as the Connect-U lawsuits were sure to be covered. What I got instead blew. me. away. The Social Network turned out to be an example of how a great director, screenwriter and cast could put their talents to the best possible use, making the outcome mindblowing. For it was fast-paced. I normally text during films, but the fast, fluid and wordy ongoings of the film made me forget all about my mobile phone for the entire two and a half hour period. It was well-structured. Making the lawsuits (which were anything but boring) the center of the film, and having the rest of the story being told in flashbacks, was a brilliant decision. It was emotional, without being corny. No “staring out of the window while an indie pop ballad plays in the background” scenes in this movie. It was well-acted. Jesse Eisenberg (who plays Mark Zuckerberg), in particular, gave a brilliant performance- from the mannerisms to dialogue delivery. Definitely the stuff Academy Award-winning performances are made of. It captured the evolution of Facebook from TheFacebook- from a “cool” thing, an exclusive thing, to something that would grow to connect millions across the world (the Facebook population is bigger than the population of Brazil). It showed how, and why, certain marketing decisions were made. 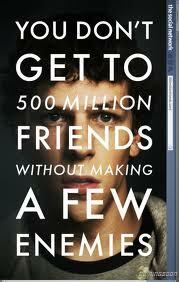 In the process, it also portrays Mark Zuckerberg (Jesse Eisenberg), as narcissistic, arrogant and socially challenged. Facebook is shown as his attempt to rise up the social ladder and get his ex-girlfriend back (causing him to lose his best friend and face two lawsuits in the process). While the Real Mark Zuckerberg criticises this premise of the film with, “They just can’t wrap their head around the idea that someone might build something because they like building things.”- lets face it, Sorokin’s and Fincher’s version makes the film more interesting, especially as it’s responsible for the dramatic way in which the movie ends.